The week commencing 25th July will see the implementation of a new Library System. This will provide us with the opportunity to greatly improve the student experience. 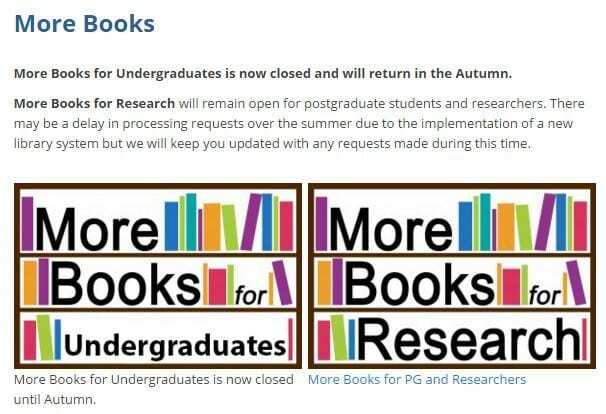 We have worked closely with students to understand what you want the new library system to do, what extra services you require, and how this can enhance your academic journey but What does this mean for me? Such points can be supported by studies too. Twitter’s dynamic arena can lead to job advice, job offers, invitations, international blogging connections, global brand awareness, and supportive relationships. Twitter is a more effective promotional tool than Facebook. Every study shows that the Twitter community is the most loyal and engaged, according to the “Social Research” study by Edison Research (2014). One study (not referenced in the book) shows that 67% of Twitter followers (versus 51% of Facebook fans) are more likely to buy the brands they follow (Schaeffer, 2014: 31). The Marketing firm SocialTwist analysed a million Facebook and Twitter followers, and Twitter’s tweets amassed over three times as many clicks on average than Facebook (Schaeffer, 2014). One last statistic. Daily Twitter users are “six times more likely to publish articles, five times more likely to post blogs, seven times more likely to post to wikis, and three times as more likely to post product reviews at least monthly compared with non-Twitter users” (Schaeffer, 2014: 36). One last thing: targeted connections. 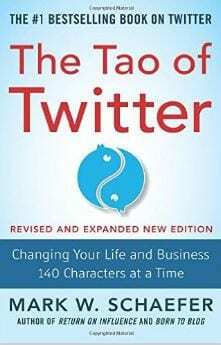 Writing a review on what must be considered as an indispensable guide for anyone using Twitter (from a business angle) it is tempting to reproduce the entire book in one blog post. So, I simply recommend that you read it instead. There’s never been a better day than today to watch events unfold than by reading the Financial Times online. At the University we have unlimited access to FT.com whose sections like Alphaville (it will ask for your university username and password) tracks the markets and an invaluable online forum. For instance, nougats like Jan Hilbebrand’s article on a secret Brexit plan (yes, one really does exists) is worth seeking out, saying that Germany’s Finance Minister Wolfgang Schäuble has already made preparations for a Brexit. 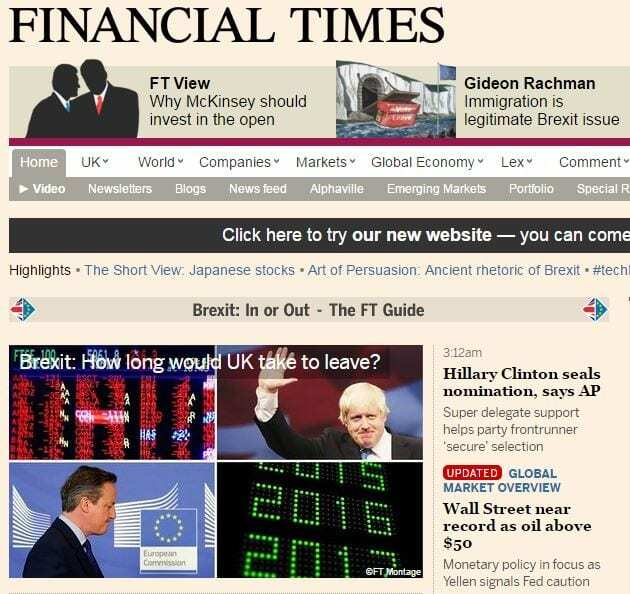 Also the fastFT (“a global team working across timezones to give you market-moving news and views twenty-four hours a day, five days a week”) is an excellent tool to follow today’s news as it appears ‘live’. The housing market, the Pound, stocks and shares, investment, the FTSE and spread betting are news stories just from the past hour as Brexit hits the financial markets. Saving the right version of a document as been a headache for me over the years. Things all over the place. Edited versions bumping into each other and overlapping occasionally. I resisted using one platform, but it exists. So I’m happy to announce my recent Damascene conversion to Google Docs. Free to use, you don’t need Word or Office at home and you can be sure that you have the right version of your document in the right place, at the right time. (You can export your file to Word if you wish). All you need is a Google Docs account which you can create easily and within seconds. It linked to my work profile on gmail so I didn’t to set anything up. Google Docs allows you to to type papers, create digital presentations, and share documents. It’s four great features includes auto-save (hurrah! ), which means that you don’t lose any work, and you can share your documents with other Google Doc Users which means you are able to collaborate and use feedback too. Lastly all you need is Internet access. It’s simple, straightforward and stress free. And a relief. You can also create multiple folders too, which means that you can use it as a separate drive and not worry about unreliable or lost memory sticks, passwords or so forth. I’ve started, and I think it’s an easy solution to the disorientation of having many files in different places and which came first. No longer a problem! 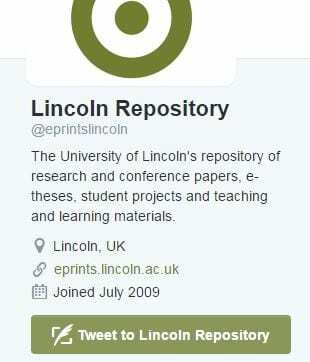 Fresh on the heels of yesterday’s post about following the University of Lincoln’s Repository (@eprintslincoln) it may be worth checking out what’s included in the archive. 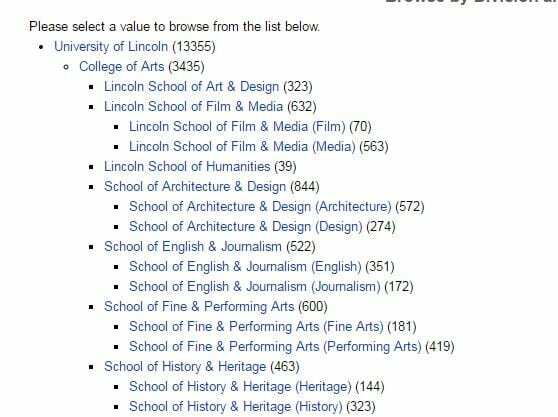 I found that it was easier to find items by searching University Structure and then scrolling down to find that the Lincoln Business School (1151) has the most uploads on the system, with the University of Lincoln amassing 13355 records in all, and an incredible 502 for this year so far (1112 for 2015). See below for a screenshot of how the Repository structure looks. Alternatively, there is a detailed advanced search facility on the home page and a useful Latest Additions to the Lincoln Repository option there too. For instance, Matthew Cragoe’s (2016) The Church of England and the enclosure of England’s Open Fields: a Northamptonshire case study. International Journal of Regional and Local History, 11 (1). pp. 17-30 was uploaded only yesterday. The Twitter feed of our Lincoln Repository is regularly updated with such interesting uploads it’s worth following @eprintslincoln. You can keep up to date with the University of Lincoln’s latest research such as Gary Bosworth et al’s (10th June upload) paper on Identifying social innovations in European local rural development initiatives which caught my eye and inspired this blog post; about how social innovations are tackling Europe-wide austerity in rural areas. If you’re interested in this paper, you’ll need to request a copy whereas Olaoye, Olanrewaju Akanbi’s (2015) Collaborative governance: The case of mass transportation in London and Lagos is available for download, a PhD thesis which, in part concludes, the central importance of the dialogue between the Mayor of London @SadiqKhan and the Governor of Lagos State, @AkinwunmiAmbode in establishing sustainable mass transportation between the two mega cities. Sometimes there are little gems that are impossible to overlook and not include on the blog. This time it’s Dr Liz Tynan’s slides from James Cook University in Queensland, Australia about writing a journal for publication during or after a PhD warning that for most researchers “publish or perish” is a stark reality. But it helps the PhD candidate in the examination process. It also hones your skills as a writer. Practise, practise, practise your writing skills. Nougats of advice include the direct simplicity of conveying complex ideas with the ‘scientific method’ where “smooth transfer of information from researcher to audience” succeeds or “bad writing can slow down or prevent the publication of good research”. Even Charles Darwin who changed the course of evolutionary theory with the publication of Origin of Species struggled with the writing process: “a naturalist’s life would be a happy one if he only had to observe and never to write”. The author must engage not distract the reader with writing errors. I also like the presentation itself, clear, precise and uncluttered. 2015-16 has been our most successful year so far from the number of students requests from students for our super More Books service. 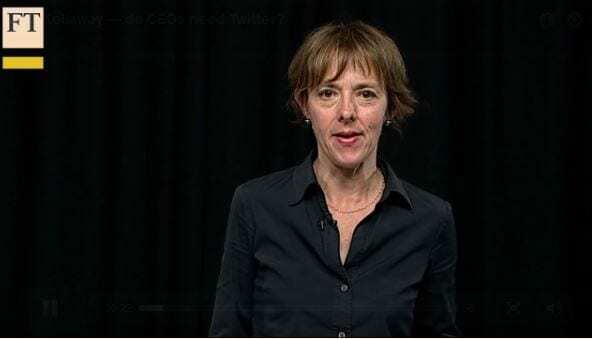 Lucy Kellaway from FT Comment advises on whether CEOs need Twitter. She’s been studying the CEOs with the most Twitter followers and examining their popularity. Some great advice here. Any CEO not using Twitter is not engaged. 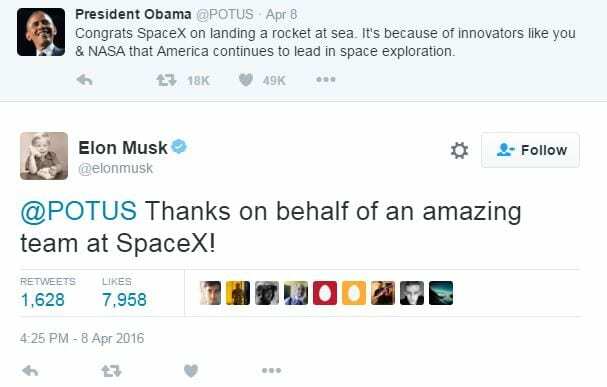 If you want to be engaging be Elon Musk (‘boy wonder stuff’) the only one she recommends. But boring bland tweets from famous CEOs get thousands of retweets, sometimes a bizarre and inexplicable phenomenon. You’ll find the video halfway down the FT.com page (there’s no embed code for all those blog aficionados out there) then you’ll need to log on using your username and password if you’re off campus. Arguably, there’s no genuine alternative to using FT.com for studying business. Crucial to any business student is access to the best up to date resources at a fingertip using a desktop, tablet or mobile, and our unlimited access to FT.com provides articles, graphs and analysis from over 600 journalists worldwide certainly provides that promise in bucket-loads. If you’re a business student, keeping up to date with news and analysis gives you the edge when it comes to writing any financial assignment; such as knowing where and what to invest in is essential insight. I’ve often wondered about the curious similarities between the skills of a research librarian and a stockbroker as both need to track the news and be fully informed about their subject area as an ongoing pursuit. Indeed, there’s really no alternative to fine tuning these skills. For instance, there’s an absorbing article ‘How long would it take to leave?’ about the possibility of Brexit, post 23rd June. You can set up alerts based on search terms via email, change your preferences, time the delivery so you have complete control over the information you receive , as well as having the option of receiving a weekly ‘letter from the editor’ with as a‘s personal views on the current news agenda and the fabulously named ‘Best of Lex‘ email featuring a compilation of the week’s best commentary. RSS feeds are another way of getting alerted to relevant news, if you want, to your desktop or mobile. 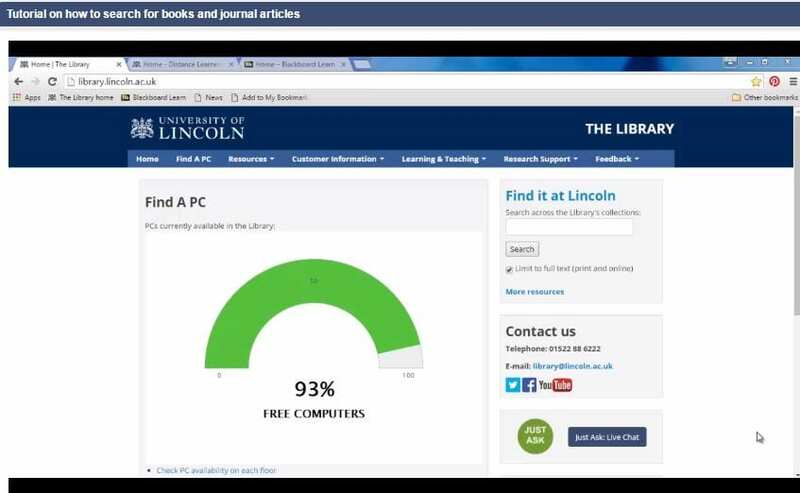 To gain access to FT.com you’ll need to go to the Library webpage at library.lincoln.ac.uk then to resources > databases > F > FT.com and register if you haven’t already done so. Plus you’ll impress the academics by regularly visiting this site (and thoroughly analysing what you find, of course!). 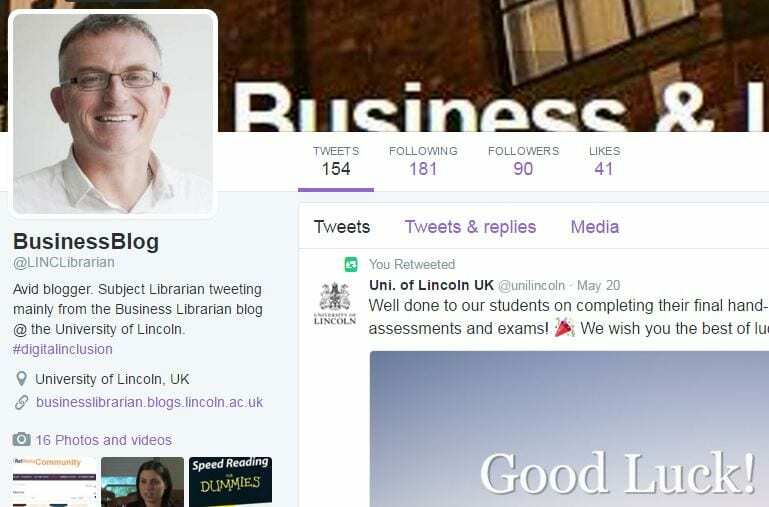 With over one hundred and fifty posts and rolling, our twitter account @LINClibrarian is another method use to promote the library to Lincoln International Business School students. I usually promote every blog post plus a couple of interesting re-tweets like those published by @GCWlibrary. Why not follow @LINClibrarian and catch up with the latest news and research insights today ?